In 2015, my blog will pertain to trying new recipes. This category features the desserts I tried. I didn’t have time to write last week but I did try a new recipe. The picture above was the desired result. They looked so cute and sounded so easy. 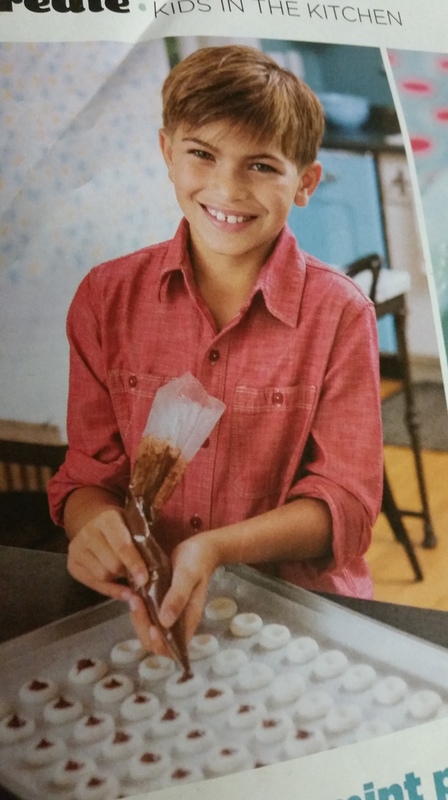 Actually, Family Fun magazine listed this in their December/January 2015 issue as something kids can do. Isn’t he darling? How this young man made this dessert is beyond me. It was not easy. I followed the directions as best as I could. I did make one mistake though. The recipe said to gradually add the powdered sugar to the room temperature cream cheese. I poured it all in. I also couldn’t get it to combine until I tossed the spoon and dove in with both hands. I washed them first, of course. 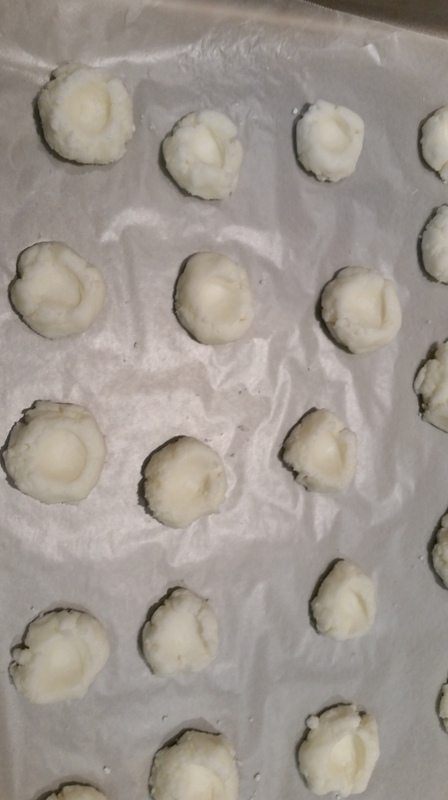 After the batter was made, I had to shape them into round balls and place them on a cookie sheet. The texture was lumpy so they stayed lumpy. No smooth white ball as pictured in the magazine. I attempted to make a nice indentation too. The words “it’s good enough” escaped my mouth and I set the tray in the refrigerator to set. The day after, I began the chocolate filling. I actually enlisted the help of two of my children since I figured an adult was incapable of making this dessert correctly. They did the filling. 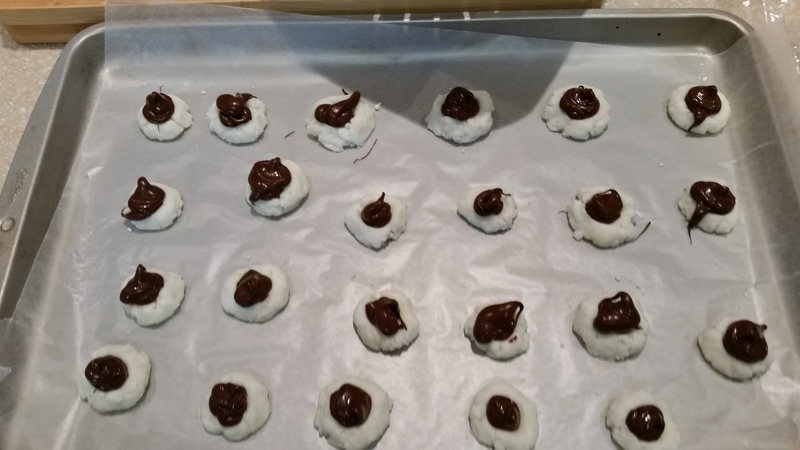 I did fill one so I could say I completed the entire recipe. 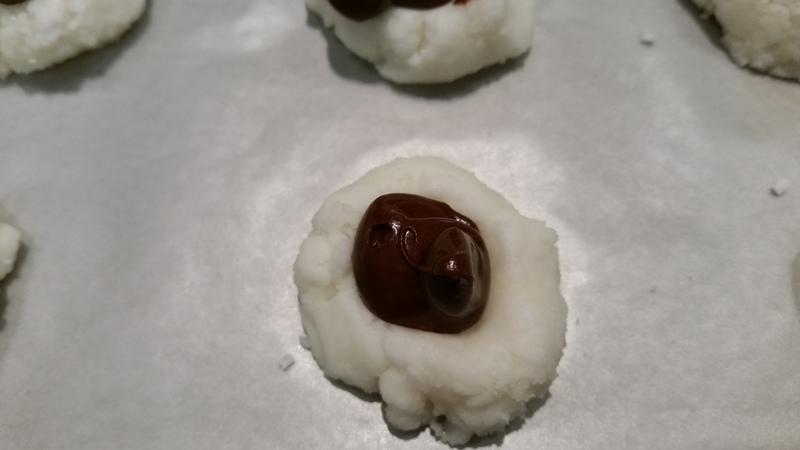 My two kids ate one before putting it in the fridge to set the chocolate. They loved them. I waited until the final product arrived. Here is a closeup. I thought they tasted so-so but the chocolate was a bit too hard to bite through. The white minty stuff did taste good. 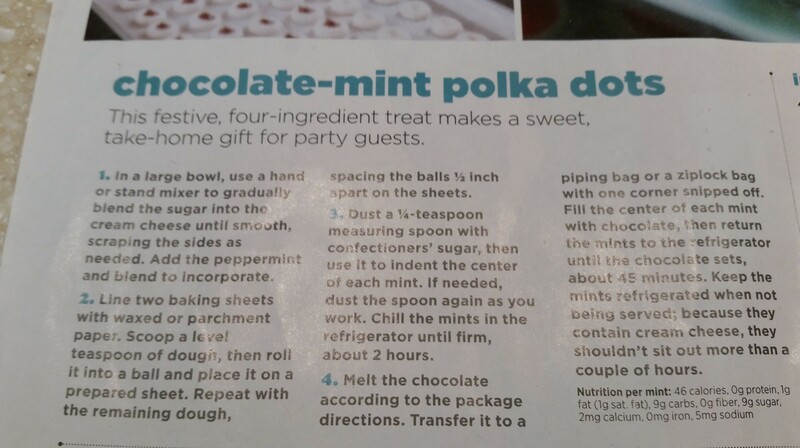 I would sooooo NOT recommend this recipe unless you are OK with white, lumpy, blob mints. It isn’t even worth retrying to work on the “add powdered sugar gradually” part. Here’s the recipe that I don’t recommend. Someone else try it though and show me it’s doable. One of my followers has to be smarter than a 5th grader.